Research shows overweight and obesity are associated with several different types of cancers. Excess body weight may be as dangerous as smoking when it comes to cancer, but few Americans are aware of this important modifiable risk factor. According to two recently published reviews, excess body fatness raises the risk of at least 13 kinds of cancer.1,2 This isn't news to cancer researchers, but it's news to Americans, about one-half of whom are unaware of any link between cancer and weight.3 "As far as lifestyle factors, next to not smoking, maintaining a healthy weight is the most important thing people can do to keep their cancer risk lower," says Alice G. Bender, MS, RDN, head of nutrition programs at the American Institute for Cancer Research (AICR). "But a lot of Americans feel there's nothing they can do about cancer. They don't see a lifestyle link." Data from the National Center for Health Statistics' 2015 Health, United States report, show that 70.7% of adults aged 20 and older are overweight, with 37.9% falling into the obese category.4 The rate of obesity among youth has been holding steady at around 17% since 2003–2004.5 The American Cancer Society (ACS) says that one-third of annual cancer deaths in the United States can be attributed to diet and physical activity habits, including overweight and obesity—the same amount caused by exposure to tobacco products.6 Maintaining a healthy weight at every age, or reducing weight when necessary, is clearly an important cancer prevention goal. Excess body fat, particularly abdominal fat, increases insulin resistance. The pancreas steps up insulin production to compensate, leading to hyperinsulinemia that may raise the risk of certain cancers.7 "Higher insulin levels lead to higher levels of bioavailable IGF-1 [insulinlike growth factor-1]," McCullough says, "which regulates cell proliferation and growth." BMI typically is used to determine what the International Agency for Research on Cancer (IARC) calls "body fatness," but BMI isn't the only important measure related to cancer risk. "A higher waist circumference (abdominal obesity) is associated with increased risk of some cancers independent of overall body weight," McCullough says, "including colorectal and possibly pancreatic, endometrial, and postmenopausal breast cancers. This is because abdominal (visceral) fat is considered more metabolically active than subcutaneous fat." Which Cancers Are Linked to Body Fatness? In August 2016, a working group of the IARC published a report identifying 13 cancers for which they found sufficient evidence linking them to body fatness, up from five in their previous 2002 report.1 In addition, the World Cancer Research Fund and AICR conduct comprehensive ongoing reviews of research on food, nutrition, physical activity, and cancer called the Continuous Update Project. Combining these sources, there's sufficient and convincing evidence of a link between body fatness and the following cancers. "At this point, the question isn't whether being overweight or obese increases cancer risk, but how can we begin to address that issue," Bender says. Preventing weight gain is the ideal. "Maintaining a healthy body weight is one of the most critical things we can do to lower our cancer risk," McCullough says. "The message is to be as lean as possible throughout life without being underweight." With regard to cancer, a healthy body weight isn't just important for prevention. "Eating well, being active, and watching weight matters in terms of chances of survival and avoiding reoccurrence as well," says Colleen Doyle, MS, RD, managing director of nutrition and physical activity for the ACS. "Watching weight postdiagnosis is critically important, particularly for breast and colorectal cancers." "It's very hard to study the effects of weight loss on cancer risk," McCullough says, "but some epidemiologic studies indicate that losing weight will decrease cancer risk, particularly for breast cancer." Other data are promising as well. "Some research has found a large reduction in cancer risk following bariatric surgery," Doyle says. Because having more adipose tissue increases certain hormones, inflammatory factors, and other cancer-promoting conditions, decreasing adipose tissue should decrease those levels. "There are conditions we know increase tumor growth, and we see them improving as people lose weight," Doyle says. McCullough agrees: "Even modest weight loss improves factors associated with cancer risk, like insulin sensitivity and inflammation, so it seems safe to presume weight loss would be beneficial. Plus, we know it's important for other conditions like diabetes and cardiovascular disease. The ACS guidelines say that losing even a small amount of weight has health benefits and is a good place to start. Even if we don't have all the data yet, it's safe to say that if you're currently overweight, losing weight is a good idea." "Of course, you can do all the right things and still get cancer," Doyle says, "but there's a lot of evidence [showing] that eating well, being active, and reducing weight can reduce risk." "We have to increase people's awareness of the connection between weight and cancer," Doyle says. Many people feel there's little they can do to avoid cancer. "It's key to let people know that, while there's no guarantee, there are steps they can take to lower their cancer risk," Bender says. Doyle agrees: "The fact that there are things we can control that can reduce our risk is a really empowering message," Doyle says. Educating people on behaviors that promote weight loss is a start. "The AICR recommends people try to move more, replace some higher-calorie foods with lower-calorie foods like vegetables, whole grains, and beans, and watch portion sizes," Bender says. 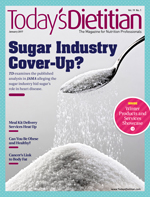 Other recommendations, such as MyPlate, the Dietary Guidelines for Americans, and guidelines from organizations such as the ACS, American Heart Association, and American Diabetes Association offer similar advice on healthful dietary patterns and habits. It's critical to help people achieve the permanent behavior changes that support reaching or maintaining a healthy weight. This can be a complex and long-term process. One way to help foster behavior change is to change the wider environment. "One of the most important recommendations in the ACS guidelines is the recommendation for community action," Doyle says. "It takes multiple sectors working together to reduce barriers and to create environments conducive to healthful choices. Health professionals, parents, community leaders, politicians … we all need to be advocates for change in our communities." Bender adds, "We need to stem the tide of obesity, not just for cancer, but for other chronic diseases as well." — Judith C. Thalheimer, RD, LDN, is a freelance nutrition writer, a community educator, and the principal of JTRD Nutrition Education Services, LLC. 1. Lauby-Secretan B, Scoccianti C, Loomis D, et al. 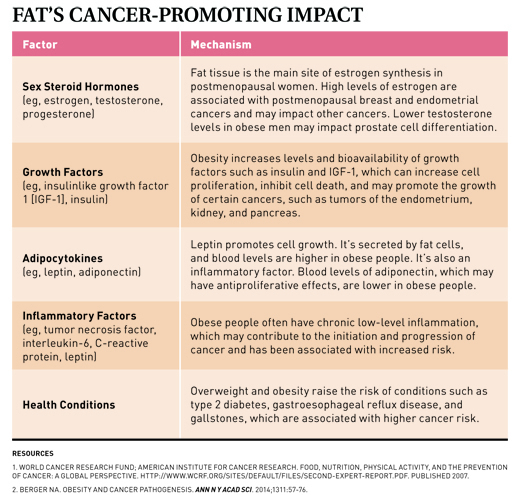 Body fatness and cancer — viewpoint of the IARC Working Group. N Engl J Med. 2016;375(8):794-798. 2. World Cancer Research Fund International. Cancer prevention & survival: summary of global evidence on diet, weight, physical activity & what increases or decreases your risk of cancer. http://www.wcrf.org/sites/default/files/CUP-Summary-Report.pdf. Published July 2016. 4. National Center for Health Statistics. Health, United States, 2015: With Special Feature on Racial and Ethnic Health Disparities. Hyattsville, MD: National Center for Health Statistics; 2016. DHHS publication 2016–1232. 5. Ogden CL, Carroll MD, Fryar CD, Flegal KM. Prevalence of obesity among adults and youth: United States, 2011–2014. https://www.cdc.gov/nchs/data/databriefs/db219.pdf. Published November 2015. 6. Kushi LH, Doyle C, McCullough M, et al. American Cancer Society guidelines on nutrition and physical activity for cancer prevention. CA Cancer J Clin. 2012;62(1):30-67. 7. World Cancer Research Fund; American Institute for Cancer Research. Food, nutrition, physical activity, and the prevention of cancer: a global perspective. http://www.wcrf.org/sites/default/files/Second-Expert-Report.pdf. Published 2007. 8. Berger NA. Obesity and cancer pathogenesis. Ann N Y Acad Sci. 2014;1311:57-76. 9. World Cancer Research Fund International; American Institute for Cancer Research. Diet, nutrition, physical activity and oesophageal cancer 2016. http://wcrf.org/sites/default/files/Oesophageal-Cancer-2016-Report.pdf. Published 2016. 10. Lin XJ, Wang CP, Liu XD, et al. Body mass index and risk of gastric cancer, a meta-analysis. Jpn J Clin Oncol. 2014;44(9):783-791. 11. World Cancer Research Fund International; American Institute for Cancer Research. Diet, nutrition, physical activity and gallbladder cancer 2015. http://www.wcrf.org/sites/default/files/Gallbladder-Cancer-2015-Report.pdf. Published 2015. 12. Teras LR, Kitahara CM, Birmann BM, et al. Body size and multiple myeloma mortality: a pooled analysis of 20 prospective studies. Br J Haematol. 2014;166(5):667-676. 13. Sergentanis TN, Tsivgoulis G, Perlepe C, et al. Obesity and risk for brain/CNS tumors, gliomas and meningiomas: a meta-analysis. PLoS One. 2015;10(9):e0136974. 14. World Cancer Research Fund; American Institute for Cancer Research. Breast cancer 2010 report: food, nutrition, physical activity, and the prevention of breast cancer 2010. http://www.wcrf.org/sites/default/files/Breast-Cancer-2010-Report.pdf. Published 2010. 15. World Cancer Research Fund; American Institute for Cancer Research. Colorectal cancer 2011 report: food, nutrition, physical activity, and the prevention of colorectal cancer 2011. http://www.wcrf.org/sites/default/files/Colorectal-Cancer-2011-Report.pdf. Published 2011. 16. World Cancer Research Fund International; American Institute for Cancer Research. Diet, nutrition, physical activity and kidney cancer 2015. http://www.wcrf.org/sites/default/files/Kidney-Cancer-2015-Report.pdf. Published 2015. 17. World Cancer Research Fund International; American Institute for Cancer Research. Diet, nutrition, physical activity and liver cancer 2015. http://www.wcrf.org/sites/default/files/Liver-Cancer-2015-Report.pdf. Published 2015. 18. World Cancer Research Fund; American Institute for Cancer Research. Ovarian cancer 2014 report: food, nutrition, physical activity, and the prevention of ovarian cancer. http://www.aicr.org/continuous-update-project/reports/ovarian-cancer-2014-report.pdf. Published 2014. 19. World Cancer Research Fund; American Institute for Cancer Research. Pancreatic cancer 2012 report: food, nutrition, physical activity, and the prevention of pancreatic cancer. http://www.aicr.org/continuous-update-project/reports/pancreatic-cancer-2012-report.pdf. Published 2012. 20. World Cancer Research Fund International; American Institute for Cancer Research. Diet, nutrition, physical activity, and prostate cancer 2014. http://www.wcrf.org/sites/default/files/Prostate-Cancer-2014-Report.pdf. Published 2014. 21. Kitahara CM, McCullough ML, Franceschi S, et al. Anthropometric factors and thyroid cancer risk by histological subtype: pooled analysis of 22 prospective studies. Thyroid. 2016;26(2):306-318. 22. World Cancer Research Fund; American Institute for Cancer Research. Endometrial cancer 2013 report: food, nutrition, physical activity, and the prevention of endometrial cancer. http://www.wcrf.org/sites/default/files/Endometrial-Cancer-2013-Report.pdf. Published 2013.